Another brainchild by local restaurant chain Paradise Group, Le Shrimp Ramen has just opened its door on 29 November 2018 at Paragon. 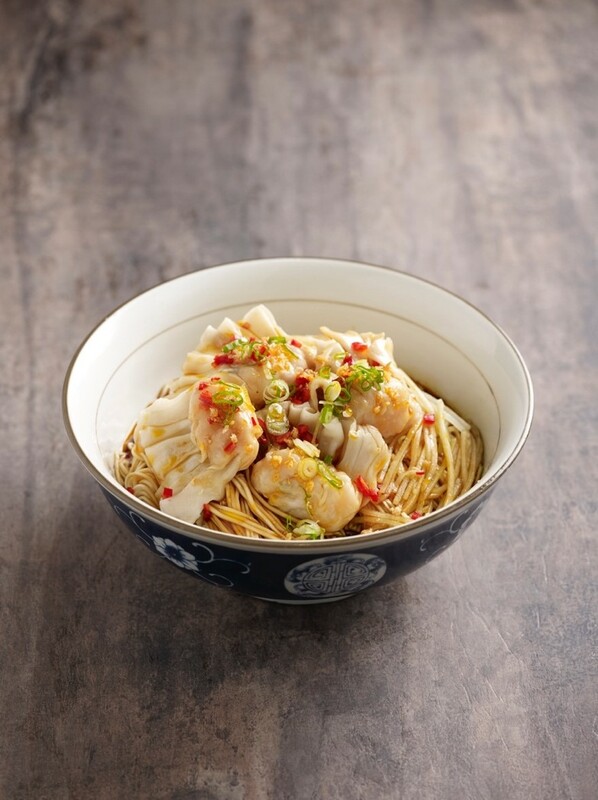 The very first Chinese La Mian concept in Singapore to offer shrimp broth, Le Shrimp Ramen is an exciting concept that marries both Chinese and Japanese culinary influences seamlessly, offering a specialty shrimp broth with silky ribbons of Chinese la mian. The launch of this 64-seater concept is part of Paradise Group’s vision to delight diners with innovative flavours and experiences. While he was in Japan, Paradise Group’s CEO Eldwin Chua stumbled upon a specialty ramen stall that sells shrimp-based broth. The flavourful broth was so delectable that it has left a deep impression on Eldwin’s mind for the rest of his journey. He then became inspired to recreate this unique broth, putting a Chinese spin on it by using local ingredients. After months of experimenting and pairing hundreds of different ingredients, the culinary team has managed to create an aromatic broth with premium and quality ingredients that brings out the natural sweetness of big prawns. Fresh big prawns are baked at 180°C for 45 minutes, hand-grinded to a fine texture, then simmered for more than eight hours with premium conpoy for an umami note. Also added to the luscious stock is a blend of spices such as star anise, cinnamon, clove and white peppercorn, giving the broth a piquant oomph. Combining the cooking style of Japanese ramen broth, Chinese cuisine and spices, as well as a unique house-style preparation method, the broth is rich, flavourful and characterized with a distinctive smoky aroma. Prawn lovers must not miss Le Signature Trio Shrimp Ramen (S$19.90). Topped with a generous serving of the freshest big prawns, handmade ebiko prawn paste and prawn dumplings, the Le Signature Trio Shrimp Noodle is an oceanic bowl of the best of many worlds, with Chinese noodles in Japanese shrimp broth. The ebiko prawn paste is shaped out of 100% prawn meat, and texturally the ebiko lends a nice juicy crunch. Other must-try shrimp ramen dishes at Le Shrimp include Big Prawns and Braised Pork Rib Shrimp Ramen (S$17.90). Served together with fresh big prawns, the pork rib is braised over long hours till tender and fragrant, boasting a melt-in-your-mouth texture. The Ebiko Prawn Paste Shrimp Ramen (S$13.90) is equally enticing. A bowl to whet the appetite and keep you slurping till the very last mouthful, the Prawn Dumpling with Chilli Vinaigrette Ramen (S$10.90) is a dish with a satisfying kick. The prawn dumplings are freshly handmade by the chefs daily, with a huge prawn encased in soft pastry skin. The al dente ribbons of noodles are tossed with moreish chilli vinaigrette that proves to be extremely addictive. The dishes at Le Shrimp Ramen are priced affordably, with a variety of noodles ranging from S$6.50 to S$19.90. The side dishes and appetisers, including Twister Prawn Rolls, Braised Beancurd in Tonkotsu Broth, Chilled Silken Tofu with Century Egg, and Long Jing Tea Lava Egg, go from S$1.90 to S$17.90. 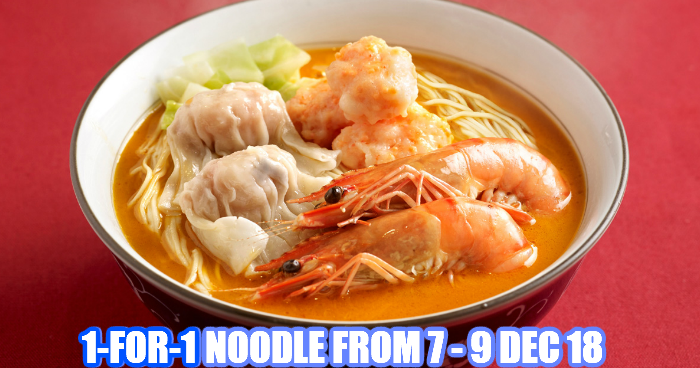 Complete your meal with a top up of S$3.20 for an appetiser and a drink with every order of noodle. The interior design of Le Shrimp Ramen is inspired by the famous Tsukiji Fish Market’s raw and lively vibes. Decorated with warm lighting and wall murals, the restaurant is characterized by dark timbre with contrasting red and white graffiti and wood textures to create a casual and welcoming dining environment. 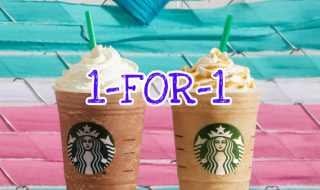 From 17 – 23 Jul, enjoy 1-for-1 drinks at Starbucks. 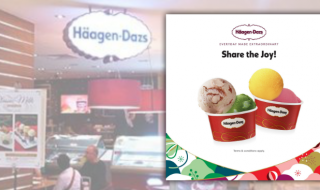 Valid for ANY drinks, ANY sizes all day long! 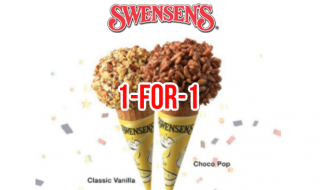 From 10 – 16 July, enjoy 1-for-1 Crunchie Cones at all Swensen’s SG outlets! 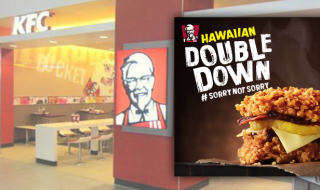 Valid for dine-in/takeaway!